Fire, Wind and Sound was the talk of the town as Timber Queensland members and delegates converged on the Victoria Park Gold Complex for the latest in Timber Queensland’s seminars. With presentations from the QBCC Technical Standards Unit, the Insurance Australia Group, Queensland Bushfire Planning as well as Multinail, RED Fire Engineers and Xlam, important topics including building compliance, storm and wind exposure, fire design, bushfire and external noise were explored in detail. For Responsible Wood the conference provided an opportunity to reinforce the forest certification message amongst architects, engineers, certifiers and specifiers of timber. Taking questions from attendees at the seminar, Responsible Wood Marketing and Communications Officer, Jason Ross, reiterated the importance of forest certification in demonstrating responsible forestry and meeting timber legality requirements. “More and more, the Responsible Wood ‘trust mark’ is being used by consumers to verify and demonstrate their commitments to timber legality as outlined in the Illegal Logging Prohibition Act and Regulations (2012) under Commonwealth law,” Mr Ross said. Responsible Wood is a Timber Queensland Silver Industry Partner and remains proudly so. 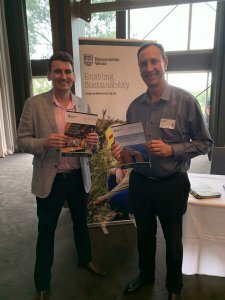 “Broadly the Timber Queensland seminars provide Responsible Wood with a terrific opportunity to reach out to the industry and educate specifiers and consumers of timber based products of the importance of forest certification,” Mr Ross said. Look out for Responsible Wood at future Timber Queensland events.